Ross was part of the intensive team to develop the DEEP ATOM underwater 3D platform. This initiative was instigated by the association of a number of key companies and individuals. 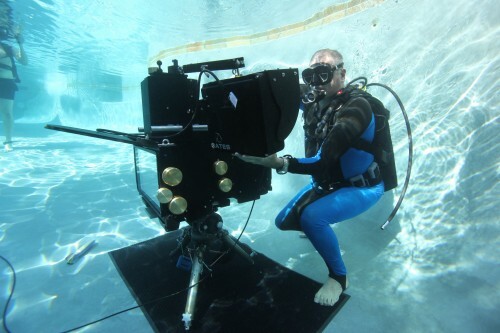 The main players in this development included John Ellerbrock (Gates Underwater Products), Pierre de Lespinois (Evergreen Films) with Bob Cranston and Ross Isaacs (Ocean Planet 3D). After the manufacture of the DEEP ATOM systems we all had to undergo an intensive training on the new equipment in Poway California. Ross visits the Gates factory in Poway California whilst development of the DEEP ATOM 3D platform. 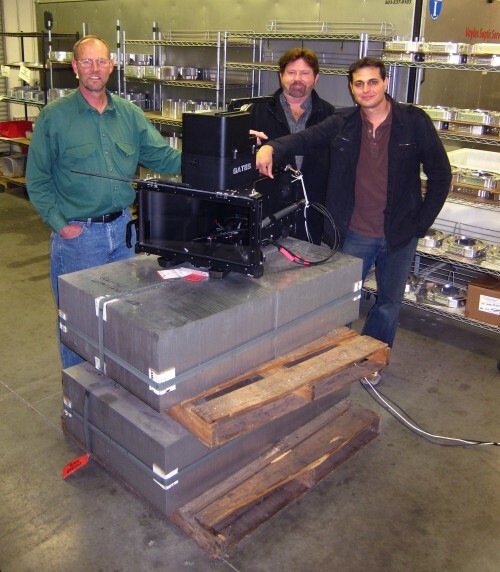 Three of the lead designers of DEEP ATOM- Bob Cranston, Pierre de Lespinois and Jason Egger with the prototype unit at the Gates factory in Poway California. Training team on Deep Atom lead by Bob Cranston and John Ellerbrock at the Gates underwater test facilities in Poway California.